The direction is a reflection of which element is the source element and which the target (it does not indicate the 'Direction' property of the connector, as defined in the connector 'Properties' dialog). The display might also show a 'bent arrow' icon, indicating that the same kind of connectors exist in both directions between the source and target elements. Right-clicking on a square gives you the options of creating, modifying and deleting relationships between elements with a single mouse click - a quick way to set up complex sets of element relationships with a minimum of effort. You can also create additional elements in the source and target Packages, and quickly add relationships to and/or from them. The Relationship Matrix defaults to show all element types. If you want to examine relationships between specific types of element, you can filter for those types. You define the element types - if necessary - as the first step in configuring the Relationship Matrix. Click on the drop-down arrow in the 'Type' field in the 'Source' row, and/or in the 'Target' row, and in each case click on the required element type in the list. The Relationship Matrix display immediately refreshes. The Relationship Matrix requires a relationship type and direction to operate on. In the 'Link Type' field, click on the drop down arrow and on the type of relationship to show. In the 'Direction' field, click on the drop-down arrow and on one of the connector directions to show, or on 'Both' to show relationships in any direction. In each case, if any relationships of that type exist they are immediately shown on the Relationship Matrix. You need to set the source and target Packages in order to display relationships, but you do this after setting the connector and element types; as the Matrix automatically refreshes after each change, this is usually faster. Having seen what relationships currently exist between the selected elements, you can review the relationship and element properties, modify them, add more relationships or delete relationships that are no longer applicable. If the source or target element 'Type' field is set to a specific element type, you can add elements of that type to the matrix and the model. In the top left corner of the matrix itself, the 'Target' and 'Source' labels have a + button. When you click on this button, the element 'Properties' dialog displays, through which you can define a new element of the corresponding (target or source) type. If there are stereotyped elements of the type (such as Actors as defined in UML, TOGAF and ArchiMate) you are prompted to select the variant that you need. This option is not available for the target or source axis if the corresponding 'Type' field is set to '<All>'. It is possible to tailor the display of information to, for example, list the Package elements in alphabetical order, show elements from the Package hierarchy, highlight elements with no relationships, and hide or show additional element name components such as level numbering, aliases and parent Package names. You can switch the display between the connector direction format and a CRUD matrix format. The CRUD (or other, customized) indicators are defined in an overlay that you create. After reviewing the Relationship Matrix, you can export the contents to a CSV file, or capture the image of the contents as a .png file or a .emf graphics file. You can also send the contents of the Relationship Matrix to a printer, after previewing the print format if necessary. The printout can be on as many pages as it takes, or you can scale the print format so that the file occupies a specific number of pages. 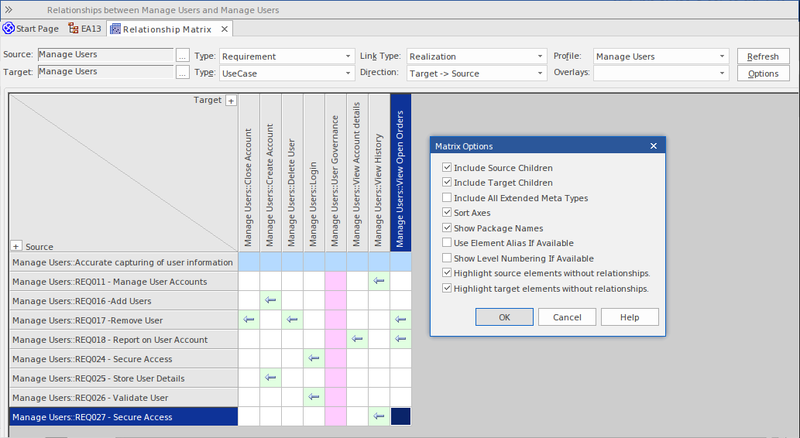 If you want to use the same Relationship Matrix settings repeatedly to, for example, monitor development of the same source and target Packages, it is possible to save the settings as a profile that can be called to reapply those settings.